The original nine man Jess Crew (Photo #1) was formed at Boise, ID. 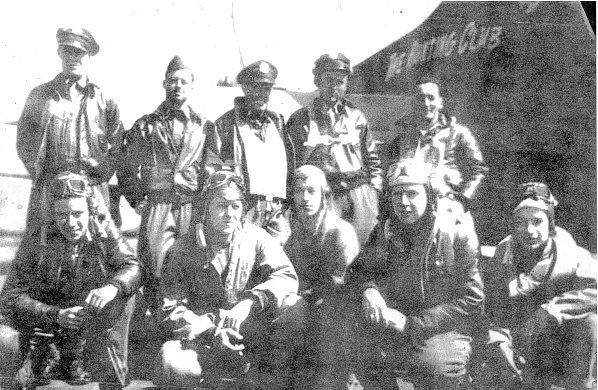 The following six original 1Lt Ray W. Jess crewmen flew all of their missions together on thirteen 303rd BG(H) missions #28, 29, 31, 33, 35, 36, 37, 38, 39, 40, 41, 42, 43: 1Lt Ray W. Jess (P)(KIA); 2Lt Robert P. Davidson (N)(KIA); T/Sgt Joseph J. Godzinski (R)(KIA); S/Sgt Byron W. Johnson (BT)(KIA) - also flew on mission #25 with the Lt Robert J. Nolan Crew; S/Sgt Charles F. Hardacre (RW)(POW) - also flew on mission #24 (BTG) and #25 (RWG) with the Lt James M. McDonald Crew; S/Sgt Frank W. White (TG)(KIA). 2Lt Harold W. Gunn (CP-POW). Flew eleven mission with the Jess crew. Lt Robert S. O'Connor flew as Copilot and Combat Instructor Pilot with Lt Jess on missions #28 and 29. Lt O'Connor was the original CoPilot on the Lt Joseph E. Haas crew and flew 8 missions as CoPilot before being upgraded to Pilot on 10 May 1943. Flew 12 missions as Pilot and was KIA on his 22nd mission, #48 on 04 July 1943. 2Lt Charles M. Box (B)(WIA), Flew on five missions with the Jess Crew (#28, 29, 31, 33 & 35). Was wounded on mission #35 when he was hit in the head by an explosive bullet. His life was saved by the quick actions of his fellow crewmen. Was hospitalized and returned to the USA. 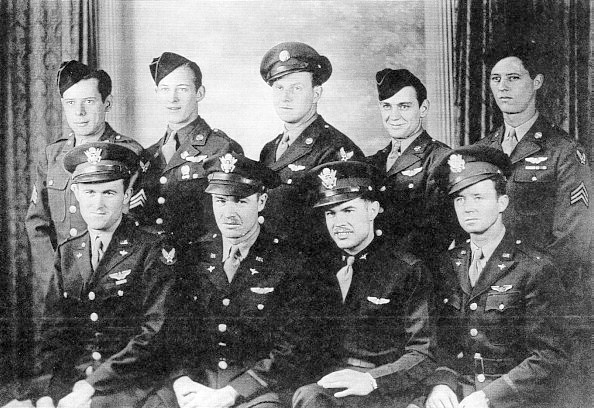 The Jess crew then flew with seven different Bombardiers on their last eight missions. 1Lt James H. Montgomery (KIA) was the Bombardier on mission #43. Sgt Sidney V. Hall (LWG)(POW) - Flew on nine Jess crew missions (#35, 36, 37, 38, 39, 40, 41, 42 & 43). Had previously flown six missions with the Lt Joseph E. Haas Crew. Three other LWGs flew with Lt Jess, on four missions, prior to Sgt Hall's crew assignment. When Lt. Harold Gunn bailed out of a burning B-17 bomber in World War II in what was his "first and only parachute jump," he knew he would probably be captured by German troops waiting in the Ruhr Valley below. He knew he was an easy target for enemy gunners proud of their reputation for shooting down American parachutists. He knew most of the 10-member flight crew were dead or dying and his chances for survival were slim. What he didn't know was how much his actions and those of his comrades in the 303rd Bomber Group of the 8th Air Force would mean to the people he was trying to keep free of Hitler's tyranny. "It's been more than 50 years, and they're still making a pretty big deal out of it," said Gunn from his Highland home, showing off his invitation from Air Force Lt. Col. Gerald Evans and Army Col. Philip C. Marcum of the United States European Command Joint Analysis Center in Molesworth, England. "I can't believe how they remember this," said Gunn's wife, Jerry. She will never forget those awful months and years when she didn't know if her young husband and the father of her baby daughter was dead, alive or would ever return. The invitation, issued on behalf of the people in Molesworth, asks Gunn to return to the United Kingdom on June 3, 2000, to be honored at the dedication of a memorial for the squadron for their valiant efforts. "Your efforts have set the standard for personal excellence," wrote Evans and Marcum to Gunn. "On June 3, 2000, we will raise a toast to all those who were lost and to those who carry the torch forward." Upon capture from a cabbage patch that June morning in 1943, Gunn, suffering from whiplash and cuts on his face from the explosion of the control panel in the plane, was marched across Germany and tossed into solitary confinement. He was interrogated at length by officers who had amazing amounts of information about the U.S. effort. He ended up in occupied Poland, wondering if this was how he would spend the rest of the war, hoping the Germans would honor the commitments made in Geneva after World War I. He spent three months in the Polish camp where the famous "Great Escape" from Stalag Luft III took place. In 1945, after Hitler ordered the evacuation of the camp, he endured a forced 50-mile march with 10,000 men in freezing temperatures and blizzard conditions to Stalag 7A, a camp in Moosburg, Germany, built for 14,000 that would house 100,000. It was so cold the men's feet froze together as they slept and the prisoners had to shuffle along each morning until they thawed enough to allow walking. At one point, Gunn and a pair of his friends had to drop back to find a fellow prisoner who'd fallen asleep against a tree. "He'd have been frozen solid without us," Gunn said. He has countless stories and sketches of the bunkmates who survived with him and escape efforts that were never stopped. "I worked on tunnels all the time I was in. We had a deck of cards made that when you put them together, they made a detailed map of where we were with train schedules and bridges and everything we knew," he said. "Our first duty was to try to escape. Our second duty was to try to be as much of a nuisance as possible." He has his dog-eared Maritime Log with drawings and journal entries that chart his long ordeal. "I swore I'd throw food away before I threw that away," he said. "That's irreplaceable." He gets tears in his eyes today when he tries to recount Patton's liberation of the prison camp and describes watching the German flag come down and the Stars and Stripes go up. "From out of nowhere came all of these little flags the Allied prisoners had made for themselves," he said. "It was quite a touching moment." Gunn and his wife aren't sure how they're going to pay for the journey over to England. At 82, Gunn is on a fixed income and doesn't have much extra cash. But he isn't worrying about it. His family, proud of Gunn's history and quick to point out that their father and grandfather is responsible for their own love of country and freedom, is rallying to try and help and have told him not to fret. "Oh yeah, we'll go," Gunn said. "I couldn't miss it."